Life is hard. I am a firm believer that there is absolutely no reason to make it any more difficult than it needs to be. In this post for the Working Mom Hustle series, I'm going to share my top 5 strategies for making my own life easier. All the plans and processes and strategies in the world won't help you, if you aren't using them. The true key to efficiency is finding what works for YOU. 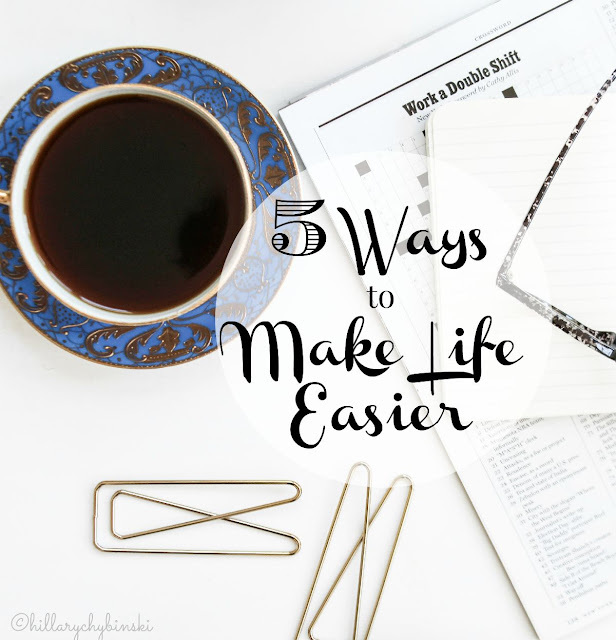 After years of practice, I've decided that right now, these five strategies are making my life MUCH easier on a day-to-day basis. So since they are working for me, I thought I would share them with you - in hopes of making your day just a bit easier. I hope you can find some inspiration for implementing your own strategies for making your life a little easier! 1. Create a Weekly Meal Plan. I've been doing this for several years. To keep myself accountable, it's become a popular weekly feature here on the blog. I'm not making anything spectacular, and I'm not making much out of a box or a can. It's real food, for real families. You can do it too, with a little inspiration, a little planning and a little creativity. Making a weekly meal plan saves me time and money. 2. Keep a color-coded Kitchen Family Calendar. I know, the rule is one calendar. But no one can see my phone, and we just don't do well with Google Calendar. So an old-school kitchen calendar works. Everyone has a color: mine is pink, John's is dark blue, Ryan's is green and Owen's is aqua. Family activities get put on in red. It's an easy method to see what's going on, and it's right there so no one has an excuse for not knowing. 3. Establish a Homework Cart. I hate homework. I never liked doing it, and now that I am a mother, I like it even less. To ease the burden, when Ryan started kindergarten 8 years ago (EEK! ), I put together a homework cart in one of those wheeled storage cabinets. I thought about what he would need to do his homework, gathered it all up, and put in the place where we had decided homework would get done. We have been using it ever since, with some modifications when Owen started school, and it needed to support two students. It still works all these years later. 4. Maintain School Binders. The crazy amount of paper that comes home from school can be really overwhelming. I had so many papers hanging on my fridge, you couldn't even see it. That's when I decided there was a better way, and I created the School Binders. Each of the kids have one and this is where I put their letter form their teacher, their schedule, any curriculum info, etc. Basically, this is a place to hold any paper I may need to refer to at some point in the school year. AT the end of the year, I move anything precious to my School of Memories filing system, and get hte binder ready for the next year. 5. Implement a Cleaning Schedule. Besides homework, I have a strong dislike for cleaning. I like things to be neat and tidy though, so it's a real dilemma. My solution was to use the method my grandmother used when I was a little girl. I tackle one "big" thing a day. For instance, Monday is bathroom day, Tuesday is dusting, etc. Obviously there are things that need to get done each day and I don't just leave a mess until the next time it's due. . .but it does break down cleaning into manageable tasks, making it less of a chore. So nothing really earth-shattering. Just 5 simple things that I have implemented or do on a regular basis, that keep my life running smoothly. When there are bumps in the road, it's always comforting to fall back on tried and true strategies. What's your best tip for making your life easier? 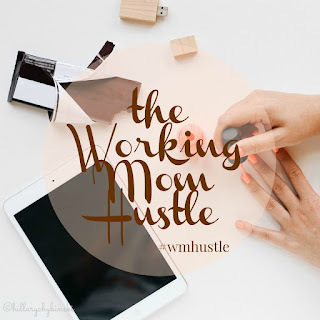 New to the Working Mom Hustle series? You can check out what it's all about here. Can you come organize my life, please? great tips!! love the school binder idea and a weekly menu plan is a saviour!! I hear ya on the meal plan...it eliminates 75% of my daily worries-- "What's for dinner tonight????" I just need the discipline to sit down and MAKE ONE each week. I also love an old-school kitchen calendar. I hate using my phone! I definitely need to take up the "one big thing a day" approach! Sounds like you've got it organized!! I need to get back into meal planning!! Meal planning is my biggest hurdle. I do it then I don't I need to get more consistent with it!